The magnetic field of our Milky Way Galaxy as seen by ESA's Planck satellite. This image was compiled from the first all-sky observations of polarised light emitted by interstellar dust in the Milky Way. The magnetic field is displayed using a visualisation technique called line integral convolution (LIC). 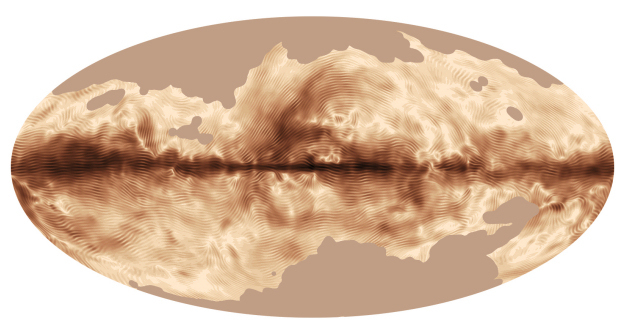 Darker regions correspond to stronger polarised emission, and the striations indicate the direction of the magnetic field projected on the plane of the sky. The dark band running horizontally across the centre corresponds to the Galactic Plane. Here, the polarisation reveals a regular pattern on large angular scales, which is due to the magnetic field lines being predominantly parallel to the plane of the Milky Way. The data also reveal variations of the polarisation direction within nearby clouds of gas and dust. This can be seen in the tangled features above and below the plane, where the local magnetic field is particularly disorganised. The image is a Mollweide projection of the full celestial sphere, with the plane of the Galaxy aligned with the horizontal axis of the oval. Certain areas in the image, mostly at high Galactic latitude, have been masked out. The overall intensity in these regions is low, complicating the separation of foreground and CMB components. Further data analysis will improve this by the time of the full data release in late 2014.